Ralph Dale Earnhardt, Sr. was born on April 29, 1951 Kannapolis, North Carolina. He died on February 18, 2001 at Daytona Beach, Florida when he was forty-nine from a crash in Turn 4 on the final lap of the 2001 Daytona 500. Everything in between is pure NASCAR Legend. The Intimidator would have turned 63 today. A 1988 feature from ESPN's Race Day America features Rusty Wallace playing a practical joke on friend and rival, Dale Earnhardt. During a February 2014 interview Dale Sr. was paid a great compliment by six-time Sprint Cup Series champion Jimmie Johnson's during a question about his biggest regret of his racing career? Not having the opportunity to "get spun out or crashed" by Dale Earnhardt Sr. Johnson answered. Johnson touched on that topic and more in a wide-ranging interview with Fox NFL Sunday host Curt Menefee, which will aired on Friday, Feb. 14, at 7:30 p.m. ET on Fox Sports 1. Johnson: "That’s one regret I have. Again, Richard (Petty) was too far removed for me to say that I had a chance to drive with him on the track. But Dale (Earnhardt), that could have happened. And I so regret that I'll never have that chance to honestly get spun out or crashed by him. That opportunity will never be there for me." Johnson: "I mean every kid, especially my generation, that black No. 3, the black No. 3, you know, that's what you wanted to be and race against. And knowing Jeff Gordon as I do and watching him race with Dale all those years and then talking about it with Jeff now there's some really cool experiences there that I would have loved to have had." NASCAR Race Mom wonders what role Dale Sr. would be commanding now had he survived that last lap crash. Do you think that he would still be a Sprint Cup Driver? Ralph Dale Earnhardt, Sr. (April 29, 1951 – February 18, 2001) was an American race car driver and team owner, best known for his involvement in stock car racing for NASCAR. Earnhardt began his career in 1975 when he drove in the 1975 World 600 at Charlotte Motor Speedway as part of the Winston Cup Series (later the Sprint Cup Series). Earnhardt won a total of 76 races over the course of his career, including one Daytona 500 victory in 1998. He earned seven NASCAR Winston Cup Championships and his aggressive driving style earned him the nickname "The Intimidator." 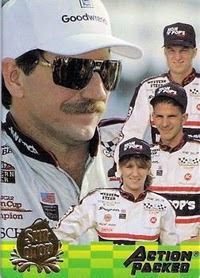 In 1995, Dale Earnhardt Sr.’s hero card featured his three children Kerry (then 25), Kelly (then 22), and Ralph Dale Jr. (then 20). 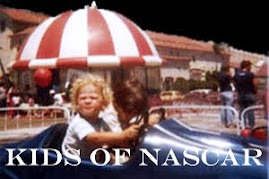 The Earnhardt children are the third generation of racers and were just beginning their racing career. Like their father, Dale Sr. and their grandfather, Ralph racing was in their blood. Today would have been Ralph Dale Earnhardt, Sr. sixty-third birthday. 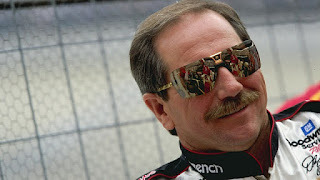 Happy Birthday to "The Intimidator." The 12 drivers have already won 20 times, and hold the honors as the youngest winners in the NASCAR K&N Pro Series, NASCAR Mexico Toyota Series and NASCAR Camping World Truck Series, as well as youngest NASCAR Whelen Modified Tour champion and highest finishing female in NASCAR K&N Pro Series history. The list also includes the 2013 NASCAR K&N Pro Series East and West Sunoco Rookies of the Year. Cole Custer (16 years old, Ladera Ranch, Calif., Twitter: @colecuster00) – A two-time winner in the NASCAR K&N Pro Series East in 2013, he opened the K&N Pro Series West season this year with a victory from the pole in Phoenix. Rubén García Jr. (18, Naucalpan, Mexico, @rubengarcia4) – The 2012 NASCAR Mexico Toyota Series Rookie of the Year continues to improve and finished fourth in the standings last season. Earlier this season, he made his NASCAR Nationwide Series debut. Gray Gaulding (16, Colonial Heights, Va., @graygaulding) – Holds the mark for youngest pole winner in both the NASCAR K&N Pro Series East and West, and recorded his first series win at Phoenix last fall. Ryan Gifford (25, Winchester, Tenn., @ryangifford2) – The NASCAR Drive For Diversity driver scored the 2013 NASCAR K&N Pro Series East win at Richmond and posted an impressive top-10 finish in his NASCAR Nationwide Series debut last August in Iowa. Austin Hill (20, Winston, Ga., @hillbroracing) – The winner at last year’s K&N East race at Dover, he has two top-five finishes in this season’s four races. Erik Jones (17, Byron, Mich., @erik_jones) – Made his mark on the NASCAR Camping World Truck Series last November in Phoenix by becoming the youngest winner in series history. 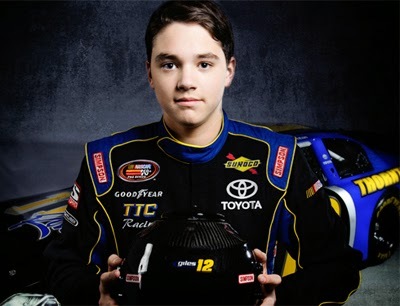 Jesse Little (17, Sherrills Ford, N.C., @jesselittle97) – The 2013 Sunoco Rookie of the Year in the NASCAR K&N Pro Series East. He made his first series start just 11 days after turning 15 in 2012. Dylan Lupton (20, Wilton, Calif., @LuptonDylan) – The 2013 NASCAR K&N Pro Series West Sunoco Rookie of the Year picked up his first series victory at Evergreen Speedway in August. Brandon McReynolds (23, Mooresville, N.C., @Bmcreynolds28) – With starts in four different NASCAR series, he is chasing the championship in the K&N Pro Series West, where he is second in points. Ryan Preece (23, Berlin, Conn., @RyanPreece16) – He became the youngest champion in the history of the NASCAR Whelen Modified Tour last season while balancing a 43-race schedule in the NASCAR Whelen All-American Series (finished fourth in the national standings) and making his NASCAR Nationwide Series debut. Ben Rhodes (17, Louisville, Ky., @benrhodes) – The current points leader in the NASCAR K&N Pro Series East with three poles in four races, and a win at Greenville (S.C.) Pickens Speedway. He scored an impressive top-10 finish in his NASCAR Camping World Truck series debut at Martinsville. Kenzie Ruston (22, El Reno, Okla., @KenzieRuston) – She finished sixth in last season’s K&N Pro Series East season standings and has top 10 finishes this season at New Smyrna and Daytona. She has the highest finish – both in a race and in the championship standings – for a female driver in K&N Pro Series East history. Race 5 of 16 at Richmond International Raceway was scheduled to be held last night following the NASCAR Nationwide Series (NNS) race. Unfortunately the rain in the early evening hours delayed the NNS race a few hours. Because of the adverse time constraints, the K&N event was postponed to this morning. They do an excellent job and give the fan that feeling that they are right there at the track. 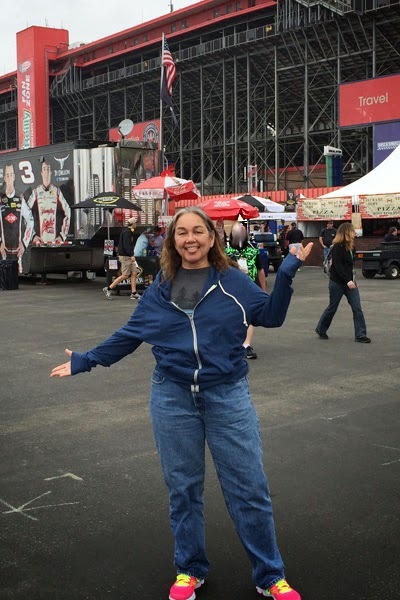 NASCAR Race Mom compares the experience to a time when you could listen to the baseball game on the radio. It is the next best thing to being there! So tune in now and "watch" as Bill McAnally Racing teammates Nick Drake and Cole Custer will lead the field to green! A young Jeff Gordon with an even younger Trevor Bayne. Bayne (born February 19, 1991), a #NASCAR Sprint Cup Series and Nationwide Series race car driver has always looked up to the four-time Sprint Cup champion, Jeff Gordon, who has also won the Daytona 500 three times. One can only imagine Trevor Bayne’s emotions when he worked the draft with Gordon in his debut series of races at the Daytona International Speedway. Bayne is best known for winning the 2011 Daytona 500, and is the youngest driver to win the race at the age of 20 years and 1 day. Take time to view this video of that Fairy Tale NASCAR-Feel-Good Ending! What - Are you kidding me! Trevor Bayne, making just his second career NASCAR Sprint Cup Series start (first at the Daytona 500), wins the 2011 Daytona 500. It is his first and to date only, NASCAR win. A legend in motor sports journalism, and former host of the very popular "Wind Tunnel" program on SPEED, Dave Despain has a new home at MAVTV and a new weekly interview series with "The Dave Despain Show" premiering tomorrow - Friday, April 25 at 8pm ET/5pm PT. To-date, MAVTV has ordered 26-episodes of "The Dave Despain Show." The 30 minute format gives the veteran interviewer the opportunity to sit with racing legends, current superstars, and rising young guns. For Despain, the new series allows his viewers an 'insiders' look behind the skill, passion, friendships, tragedy, courage and technology breakthroughs that makes motorsports such a thrilling spectacle. Debuting with NHRA superstar John Force, guests this season include: Clint Bowyer, Cory Kruseman, Dennis Anderson, Bobby Unser, Scott Bloomquist, Kyle Larson, Jeremy McGrath, Parnelli Jones, Ivan Stewart, Antron Brown, Forrest Lucas, and Dan Gurney. Dirt or asphalt, quarter-mile or banked super speedway, two wheels or four; Despain has reported on everything from NASCAR to dirt bikes. Having over 40 years experience with ABC, CBS, ESPN and TBS as a broadcaster; Despain will now share insights with MAVTV viewers on Friday nights, along with hosting duties for special MAVTV live racing events throughout the year. Bob Patison, President of MAVTV, knows Despain as a respected motor sports journalist, and a giant asset to the fast-rising MAVTV channel. "'The Dave Despain Show' will be a flagship series for MAVTV," Patison said. "Dave is one of the most respected names in motor sports journalism. He can now draw stories and memories from guests in a longer format that will definitely surprise and entertain MAVTV viewers." Originally from Fairfield, Iowa, and now living outside of Atlanta, Despain most recently hosted "Wind Tunnel" starting in 2003 and wrapped in 2013 after 594 episodes. Despain entertained and informed viewers for nearly 11 years before signing off by reminding people that "racing is fun, it's supposed to be fun, so keep it that way." Today, Despain said one of the goals for the new show is to reveal a side of racers never seen before and the interviews are exceeding his expectations. "MAVTV provided a format where I can really talk to people one-on-one and learn some of the behind-the-scenes truths," Despain said. "It has been one of the coolest experiences yet and some of the stories are amazing. The quality and variety of guests is staggering, and the interviews reveal stories that even I haven't heard in over 40 years of covering racing. The end result is deeply satisfying and I'm sure the viewers are going to love it." Five NASCAR Sprint Cup Series teams pushed 217 mph and beyond during the two-day tire test at Michigan. 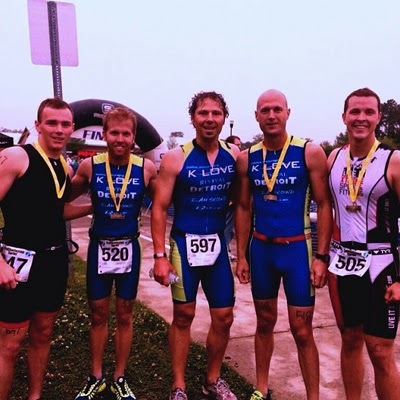 @CelsiusOfficial #NASCAR Driver Blake Koch participated in his second sprint triathlon this morning in Charleston. His past time was 1 hour 22 minutes. The triathlon consists of a 500-meter swim, 20-kilometer bike ride and 5-kilometer run. Koch (@BlakeKochRacing) tweeted his fans earlier that he and fellow NASCAR Driver, Trevor Bayne hoped to complete the event in less than 1 hour, 8 minutes. As you can see from the photo above Blake just missed his goal a bit, but bested his previous time considerably! Now, tell me again that #NASCAR Drivers are not athletes! 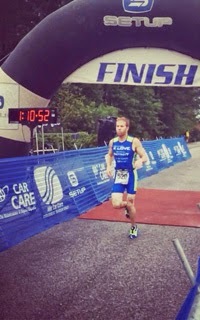 Finished the Charleston Sprint triathlon today in 1:06.52 15th over all and 3rd in age group. Had a blast. Thank you @celsiusofficial for the energy and endurance , @travisliveitx for the fast bike and @joshwiseracing for the coaching! No One ever wins those right? Beginning June 21, racing fans can enter the Kwikset “I Heart the Mayor” sweepstakes by visiting www.iHeartTheMayor.com. Until Burton races at this year’s Coke Zero 400 on July 6, fans can tweet about the RCR driver through www.iHeartTheMayor.com with the hashtag #TweetToWin. The more fans tweet from the site, the more sweepstakes entries they receive. During the race on July 6, the sweepstakes launches and visitors can participate in a live Twitter race between Jeff and five race day competitors. By continuing to tweet for Burton throughout race day, fans can unlock additional prizes and sweeps entries. 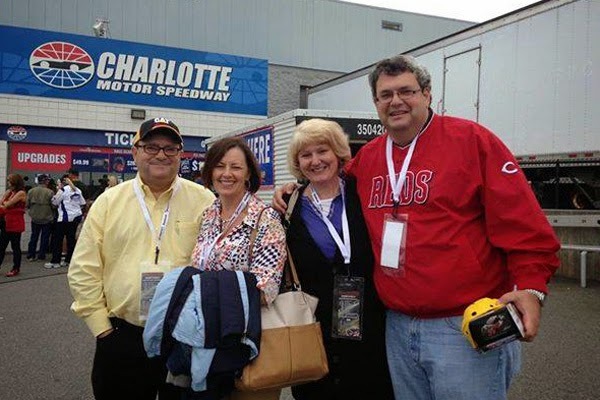 Access to the race on October 12, in Charlotte, N.C.
Round-trip coach class air transportation for up to four to Charlotte, N.C.
My friend Blake was that “One lucky participant,” the Grand Prize winner of the fantastic ‘VIP Experience’ prize listed above. He spoke with excitement as he explained how he and his three guest were on the track with the racers before the NASCAR Race in Charlotte, N.C.
NASCAR Race Mom has really been wanting to visit the Childress Vineyard, so the Lunch for Four at the Bristro must have been amazing! Blake was even allowed to attend the Driver’s Meeting before the race and stand in with Jeff Burton’s Crew Chief during the race! So what did this Non-NASCAR fan think of his first NASCAR Race Experience? 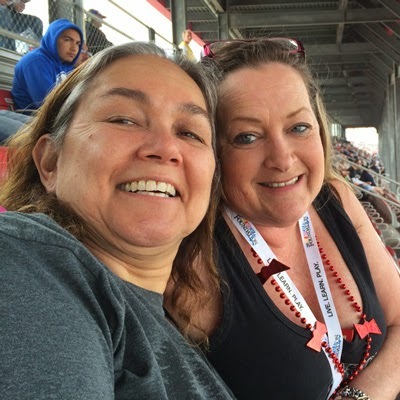 "This was my first-ever NASCAR experience and one I won't soon forget. Kwikset went above and beyond to plan every detail of our trip and Jeff Burton couldn't have been nicer." 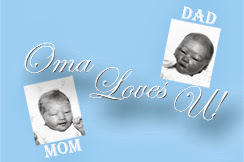 NASCAR Race Mom can attest, first hand, to the magnificent experience winning one of the NASCAR contests represents. It affords the fan to access denied the average race attendee. As you can see, real people do win these great sweepstakes opportunities! Therefore, next time you see one of those NASCAR Sweepstakes, take a second and enter! Then keep your fingers crossed that you too win that dream NASCAR Trip of a Lifetime. talks with son Chase during the 2002 Pennsylavania 500 at Pocono Raceway. Young Chase Elliott has been burning up the NASCAR Nationwide Series ranks in the No. 9 JR Motorsports Chevrolet, which he's put into Victory Lane in each of the last two races. But in the long history of what we now call the NASCAR Sprint Cup Series, it's Chase's dad, Bill Elliott, who has had the most success driving the No. 9. DAYTONA BEACH, Fla. – NASCAR announced today the broadcast schedule for the remainder of the 2014 NASCAR K&N Pro Series events on FOX Sports 1. 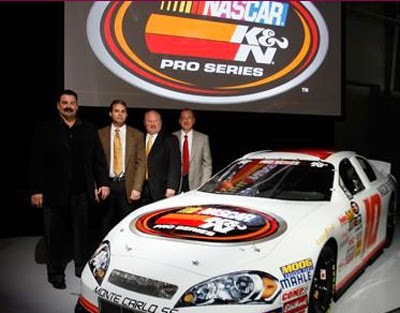 “The NASCAR K&N Pro Series features the next generation of top-level NASCAR stars competing alongside accomplished veterans and FOX Sports’ coverage of the series provides a great platform to showcase these drivers,” said George Silbermann, NASCAR vice president, regional and touring series. Subject to change. Consult local listings for most updated information. Crown Royal is honoring the people who Reign On across the country every day. 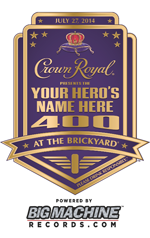 Nominate your hero now for a chance to win naming rights to the Brickyard 400®. Consumers who are 21+ can visit CrownRoyalHeroes.com to nominate their own heroes, for a chance to win naming rights to the race. Nominations will be accepted through April 13th, with finalists being announced at the end of April. That give you just a couple of more days! The grand prize winner will receive naming rights to the Brickyard 400® and so much more! 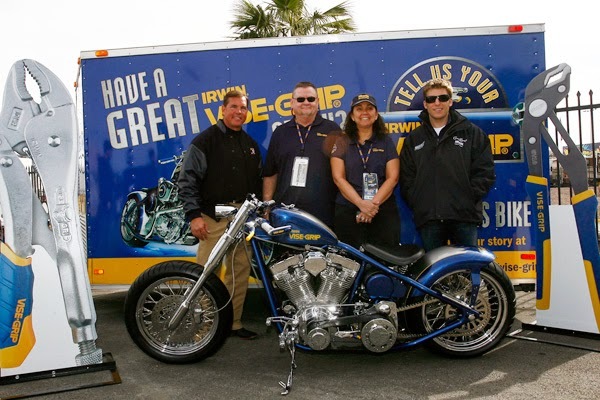 Held at Indianapolis Motor Speedway on July 27, 2014, the winner will get the experience of a lifetime and a chance for his or her inspiring story to be shared from coast to coast. This is an amazing "once in a lifetime" opportunity - just ask Samuel Deeds @marinegunney‎. 43 Cars - 200 Miles Per Hour - Inches Apart. 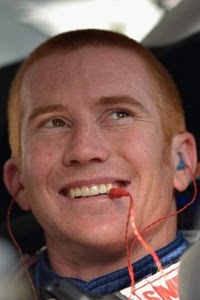 In front of tens of millions of people... for the first time ever; watch #NASCAR Sprint Cup ‘Rookie of the Year’ candidate Cole Whitt as he kicks off his rookie season by taking on NASCAR's biggest race in his no. 26 Speed Stick Gear blue and white race car. NASCAR Race Mom’s favorite part of the film has to be the dramatic fashion in which Whitt accomplished the feat of qualifying for the big show. Driving for Swan Racing, he had to battle his way into the Daytona 500 by finishing the qualifying race fifteenth or better. After 60 laps of green-flag racing in the first Budweiser Duel at Daytona International Speedway, Whitt made several swift moves in the final lap, to advance the No. 26 Toyota from seventeenth to twelfth. This documentary is done very well and successful in providing the NASCAR fan an appreciation for all the preparation and frustrations a NASCAR Sprint Cup team encounters. 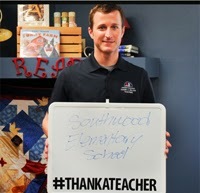 #NASCAR Driver "Thanks a Million Teachers"
at the Texas Motor Speedway. The largest-attended, single-day sporting event annually in Texas with estimated average crowds in excess of 150,000 is now known as the Duck Commander 500. The Duck Commander brand will enjoy a substantial product presence on its race weekend and throughout the year at Texas Motor Speedway. An extensive line of Duck Commander 500 merchandise will be sold at track and in the Speedway World souvenir store year-round in addition to being available through Duck Commander retail partners. About Duck Commander: Duck Commander is a family-owned and operated business that was established in 1972 by Phil Robertson and based in West Monroe, Louisiana. What once began as a duck call centered company has grown into a multi-million dollar empire with Phil's four sons, Willie, Jase, Jep, and Alan, and their wives at the helm. Duck Commander products, which now include much more than just duck calls, have been sold in all fifty states and in several countries and encompasses lifestyle brands including Duck Commander duck-hunting merchandise, Buck Commander deer-hunting merchandise, Duck Girl apparel, Duck Commander Wine, and more. Each of the Duck Commander brands was created with a focus on bringing family together. It is their motto of faith, family, and ducks that has resonated with fans at their speaking engagements and on the No. 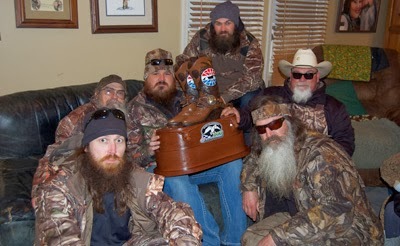 1 cable show "Duck Dynasty." Their perseverance, business savvy and knack for storytelling also landed them at the top of the New York Times' Best Sellers list three times with titles "The Duck Commander Family," "Happy, Happy, Happy: My Life and Legacy as the Duck Commander," and "Si-cology." Last fall the family celebrated their first venture into music with a No. 1 debut of their holiday album Duck The Halls: A Robertson Family Christmas. For more information, please visit www.duckcommander.com. Texas Motor Speedway in Fort Worth, Texas. About Texas Motor Speedway: Texas Motor Speedway, with a crowd capacity in excess of 180,000, is among the largest sports stadiums in America and features an array of amenities that make it one of the premier venues in the world of sports. Known as "The Great American Speedway!," the 1.5-mile superspeedway located in Fort Worth plays host to two races in the NASCAR Sprint Cup Series, Nationwide Series and Camping World Truck Series as well as one in the IndyCar Series. 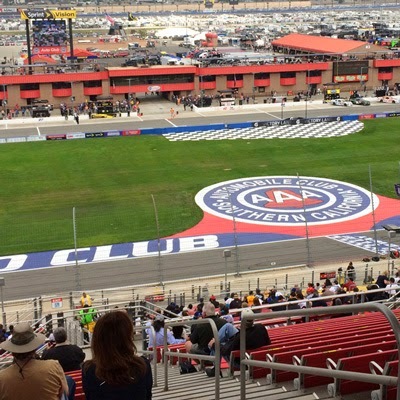 The attendances for the NASCAR Sprint Cup events since the facility opened in 1997 annually rank among the largest sporting events in the United States and also are the largest-attended, single-day sporting events in the state of Texas. Texas Motor Speedway is owned and operated by Speedway Motorsports, Inc., a publicly traded company that is a leading marketer and promoter of motorsports entertainment in the United States. For more information, please visit www.texasmotorspeedway.com. 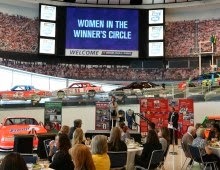 Female trailblazers in NASCAR recently visited the NASCAR Hall of Fame to celebrate the opening of the new “Women in the Winner’s Circle” exhibit. 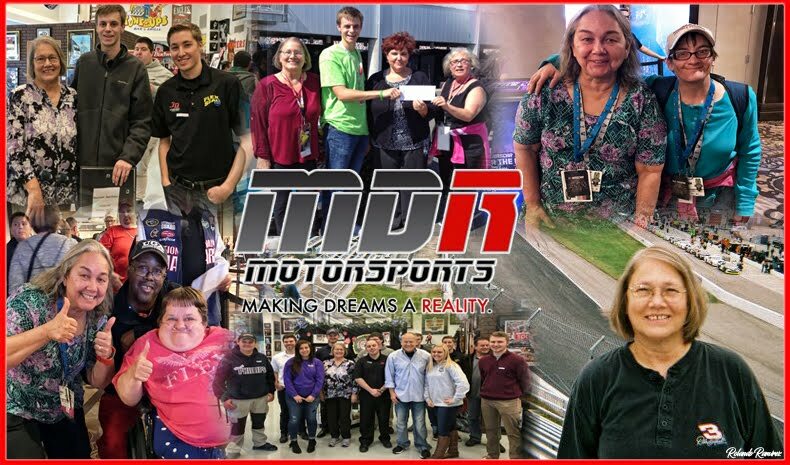 Attendees included JR Motorsports Co-owner Kelley Earnhardt Miller, former IndyCar driver Lyn St. James, NASCAR VP and Deputy General Counsel Karen Leetzow and NASCAR Whelen All-American Series and NASCAR Drive for Diversity driver Paige Decker. Each shared how their experiences have helped pave the way for a new generation of women leaders in the traditionally male motorsports industry. The “Women in the Winner’s Circle” exhibit will be open through June. Two weekends ago, NASCAR Race Mom had a hard decision to make. 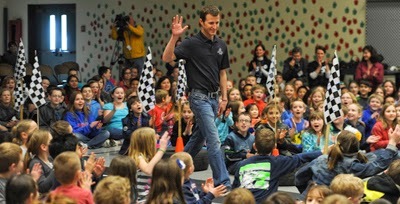 The top NASCAR Series, Sprint Cup and Nationwide were in town. However, the K&N Pro Series West was also racing that Saturday. NRM loves both the West and Nationwide series! Quite honestly, the West and Nationwide races are dearer to my heart than Cup! Believe me when I tell you it was not an easy decision; nonetheless an opportunity for free Nationwide tickets in an awesome section made the resolution a tad easier. NASCAR Race Mom made the right decision. Tired of coming up short, Twenty-One-Year-Old Rookie, Kyle Larson fought hard for his opportunity to see Victory Lane in a Nationwide race. The home state boy (California) did not flinch Saturday afternoon, turning back three hard-nosed Sprint Cup vets to cash in with his first Nationwide victory in 38 career starts. Though Auto Club Speedway is a solid six-hour drive from his hometown of Elk Grove, the special milestone after a quintet of agonizing runner-up finishes in the series was extra savory in the backdrop of his home state. NASCAR Race Mom was thrilled to witness the NASCAR exhilaration as Larson, Kyle Busch and Keven Harvick battled for the win. Every fan remained standing and cheering for the last sixteen laps. "I feel amazing right now," said Larson, "Probably more excited than I thought I would feel since I had gotten close five other times to winning a Nationwide race, but the way we got it done there at the end, beating Kyle, Kevin and Joey Logano was awesome." Larson, who punctuated the win with a patented steering-wheel-less burnout and beamed as several drivers and crew members came to congratulate him in Victory Lane. The sprint-car standout's rapid rise through the stock-car ranks includes a NASCAR Camping World Truck Series win last season at Rockingham and a full-time Sprint Cup roster spot this season, just two years removed from his championship in the developmental K&N Pro Series East. NASCAR Race Mom would not be surprised if the “TreatMyClot.com 300” is heralded as the best Nationwide race of 2014! Larson did make his mark in history Saturday when he became the first California native to win a Nationwide race at the 2-mile oval. 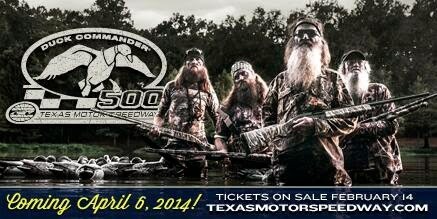 Duck Commander 500 at the Texas Motor Speedway.